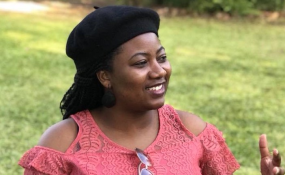 Joana Mamombe stood out as the youngest MP in the new Parliament when Zimbabwe's newest crop of legislators took their oaths last week following the controversial July 30 elections. Mamombe of the MDC Alliance replaced Jessie Majome as the Harare West representative. The 25-year-old legislator, a molecular biologist, says one of her major priorities in the next five years is to fight cancer. Mamombe (JM) told our senior parliamentary reporter Veneranda Langa (VL) that she also wants to use her five-year term in the legislature to advance the interests of youths Below are excerpts from the interview. Who is Honourable Joana Mamombe? I was born on 18 June 1993 in Harare. I grew up in a Christian family devoted to the Reformed Church of Zimbabwe. I am very passionate about young people's participation in political and governance matters. In terms of education, I trained as a molecular biologist at the universities of Bergen in Norway and Sussex in the UK where I studied for an MSc in molecular biology and genetic manipulation respectively. My research interests focused on cancer therapies and neurodegenerative diseases like Parkinson's. I am a recipient of the 2017 Cannon Collins Scholarship, a prestigious academic award for postgraduate study in the United Kingdom. In 2016, I was also awarded the Students at Risk Award (STAR), a flagship scholarship of the Norwegian government for students facing persecution in their own countries. Lastly, I am a graduate of the Chinhoyi University of Technology (CUT) where I completed a BSc in Biotechnology. I, thus, have a very strong background in public health and cancer research. How did you get into politics and what drove you to become a politician? I became active in public and political affairs at the CUT, where I joined student politics and subsequently became the first female secretary-general at the university and also later served as national gender secretary for Zimbabwe's national students body, Zinasu. In this role, I was involved in and coordinated several campaigns to highlight the plight of students in Zimbabwe. Some of these campaigns came at great personal risk as in 2015. I am also one of the co-founders of #Tajamuka -- an initiative of young people that challenged the government of Zimbabwe on the growing social and economic challenges in 2016. In 2014, in recognition of my courageous work, I was chosen to attend a global conference in Denmark marking 100 years of women in politics and leadership. In 2017, I was invited to be a keynote speaker at the Network of Universities from the capitals of Europe where I spoke about young people as change makers in a rapidly globalising world. I was also invited as a guest speaker at the International Students Festival in Trondheim (ISFIT), Norway, focusing on public health, particularly how Zimbabwe is tackling cancer. All these speaking and global commitments have prepared me for public office and form my early entry into public life. The obtaining political situation and the dearth in public leadership to deal with rising unemployment and hopelessness drove me into politics as I was keen to make a mark and define policies that grow our economy and change the systems of governance. In addition, the leadership training sessions that I went through over the years also moulded me to be the person I have become today. You are taking over from Jessie Majome who fiercely competed with you during the party primaries and harmonised elections. Have you buried the hatchet? I have always maintained that there is no hatchet to bury. My campaign was never about honourable Jessie Majome or about fighting anyone. It is unfortunate that some people saw this as a fight rather than a democratic contest. The rules of the party are clear that all leaders are subjected to validation and that members are free to contest. I am certain that we will have a platform to share a few ideas about Harare West and Parliament and there is a lot to learn for young and new MPs like myself. Did you learn anything from Majome during her tenure as MP? Any grooming received from her? I did learn a lot from Hon Majome, especially around communicating using new media tools as it provides up-to-date and timely engagements. But I also learnt that nothing replaces face-to-face and personal engagements. In this regard, I have lined up town hall meetings to engage with Harare West residents, of which, this should serve as the bedrock for the constituency legislative agenda as well as our 100-day plan. I will use social media, but will keep personal engagements as an active form of my community consultation. I have also learnt that it is imperative to link the parliamentary work with the day-to-day struggles of ordinary people. It serves no purpose to be a star in the august House if constituents cannot identify with that stardom. I have also learnt that it is important to have an agenda. Hon Jessie Majome served Parliament with a clear human rights promotion agenda and I think she was successful. What are the challenges that face young female politicians like yourself? The major challenge facing young female politicians is matriarchy and patriarchy. Political spaces are difficult to penetrate as the spaces are heavily male-dominated. To add insult to injury, there is no clear grooming and sometimes succession planning by mature sisters in political parties. If at all, in some instances they create an impervious barrier to rising young female politicians. In a way, it's a double tragedy. On so many times I was told I was young and should not contest for political office. It is thus a lonely and gruesome fight that requires lots of courage and determination. There is a sad and misguided belief that young female politicians do not have innate agency to contest for political office and that in fact senior male leaders are behind our political bids, this is unfortunate. It is also difficult to fund-raise as this may expose you to unwanted and unsolicited advances from would-be funders. So, it requires discipline and uprightness. As a young MP, what do you seek to achieve in the next five years of your term? I seek most importantly to push the MDC Alliance agenda as encapsulated in the SMART agenda launched earlier in 2018. More specifically, as a public health specialist, I seek to be the leading voice in the fight for improvement of our archaic public health laws and systems. I also want to deploy my knowledge and skills on cancer to fight for enhanced and accessible services for ordinary people particularly women. Cancer is the leading cause of death and women bear the brunt of this condition. Cancer medications are expensive and inaccessible and yet there has been little investment and research on this disease. It comes without mention that I will be an ambassador for young people and to advance policies and laws for employment creation and business opportunities. For my constituency in Harare West I seek to bring fresh ideas around mobilising the local economy and the massive industrial portfolio to create opportunities. I seek to link the council work and the parliamentary agenda in order to respond to day-to-day challenges faced by local people. Do you have any plans to speak for youth empowerment during your tenure as MP? What are the issues affecting young people? Young people face unemployment and lack of business opportunities. They face hopelessness in the face of blocked democracy and few spaces for participating in the development process. Young people have no capital and skills to begin their own businesses. I will speak on youth issues from my lived reality. In my manifesto, I indicted that I would be a voice for young people and would demand their space in the development process. Our national budget must focus on developing and creating opportunities for youth empowerment on a non-partisan and inclusive basis. It is thus imperative, without sounding naïve to the political realities, that as a young MP I seek to bridge the political divide on matters critical to young people so that laws and policies as well as government programmes are designed. There is also urgent need to deal with the rising problem of drug abuse, which in now endemic in our communities. Do you have any political ambitions that can see you seeking higher office? I am keen on advancing my studies while I serve the people of Harare West so that I continue to improve my knowledge and skills within the health sector. After all, the sky is the limit. This will give me the requisite stamina to be a leading voice on public health matters in our Parliament. If at all, I would like to be known as a leading voice on these issues. As a product of a single mother, I would like to be an inspiration to young women to invest in their children's education and to encourage them to take leadership positions. I will continue to serve my party and stand ready to accept any responsibility given by the leadership and membership. I just want to thank the lord for he has taken me this far. Also, I owe this to my mother for her guidance, love and unwavering support in my political career.